Afro-Cuban beats and joyous dancing filled the aisles when Buyepongo played their percussive Latin dance music on Saturday, January 22 at the Multicultural Center. Even from the beginning of the performance, the musicians encouraged the audience to get out of their seats and dance wherever possible. Instead of merely performing, the group’s energy made it seem as if everyone was part of the show. 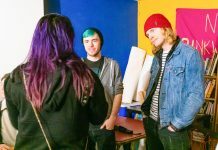 “It was a lot of fun,” said Lauren Cox, a first-year Music major at UCSB. With more than three musicians on percussion at any given point, complex rhythms highlighted the performance. In addition to bongos, maracas, cowbells and a xylophone, syncopated clapping provided the beats that whisked listeners onto their feet. Lead vocalist Bardo Martinez rubbed ridged pieces of metal against one another to provide a percussive zipping sound and a funky bass line brought all of the beats together. Various brass and woodwind instruments complemented the driving rhythms. Buyepongo played an eclectic fusion of musical styles from all around the world, including waltzes from Europe and even melodies from traditional Native American songs. 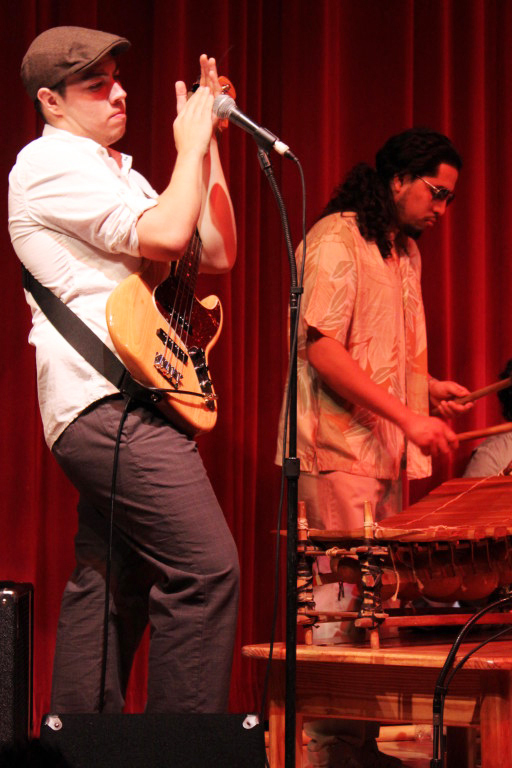 “Many of our songs feature Vodoun rhythms from Africa and Cumbia rhythms from Columbia,” said xylophonist Roberto Navarro. 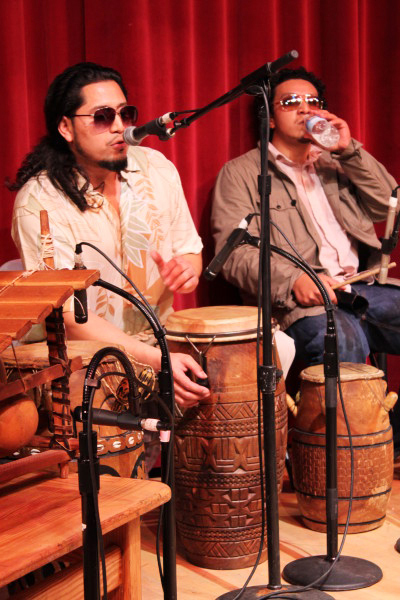 Buyepongo also explained the origins of their name: “Buye” came from the term “Booyah,” an exclamation of excitement, and “pongo” came from the heavy use of bongos and other percussion instruments in their songs. All over the theater, people danced the meringue, salsa and other Latin dances. The band played without any long breaks, and the fast pace of the songs had the audience gasping for air. Elda Schaffield, Webmaster for UCSB’s Kavli Institute for Theoretical Physics, said that the performance was “¡Buenissima!”, very good. The band was so enthusiastic that they wanted to keep playing even when their time was up, and they asked if they could keep playing at an after-party somewhere. “The love at UCSB is beautiful,” said Navarro, adding that the beautiful atmosphere helped them to play.